TwistedWave is also available for iPhone and iPad! 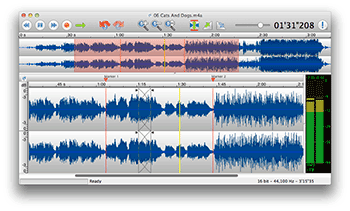 "Twisted Wave is my go to audio editor. It's powerful, well designed, and the batch functionality is a lifesaver in our production flow." "Thank you for the incredible software support - it is the best I have ever had from any company." "Punch Audio loves Twisted Wave for all our Audiobook production. It's intuitive ease of use makes all aspects of single track recording and mastering most satisfying." "Twisted Wave has become an invaluable part of my voice-over business. It's superb in its simplicity." "Absolutely loving TwistedWave! Well done." "Thanks again for a great program!" 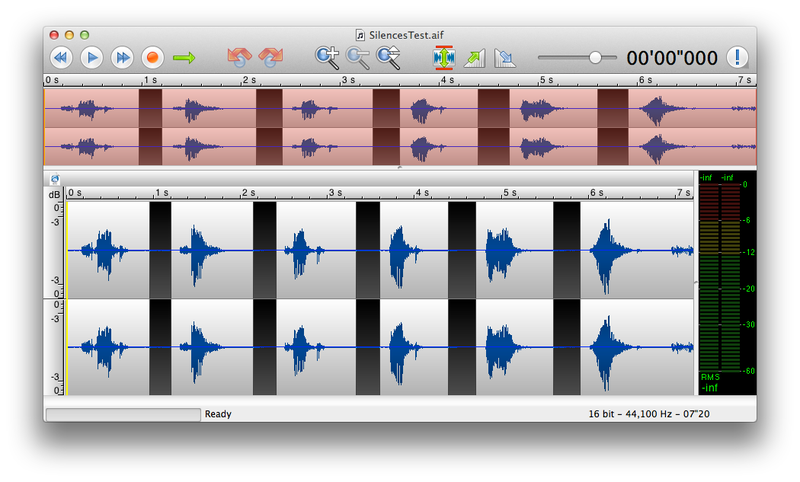 TwistedWave, an audio editor for mac. Easy to use, fast, powerful. Mastering. Equalization, compression, limiting, you name it... From the hundreds of available Audio Unit or VST plugins, you will surely find the right one for the best effect. Converting files. TwistedWave can read and write files in many different formats. 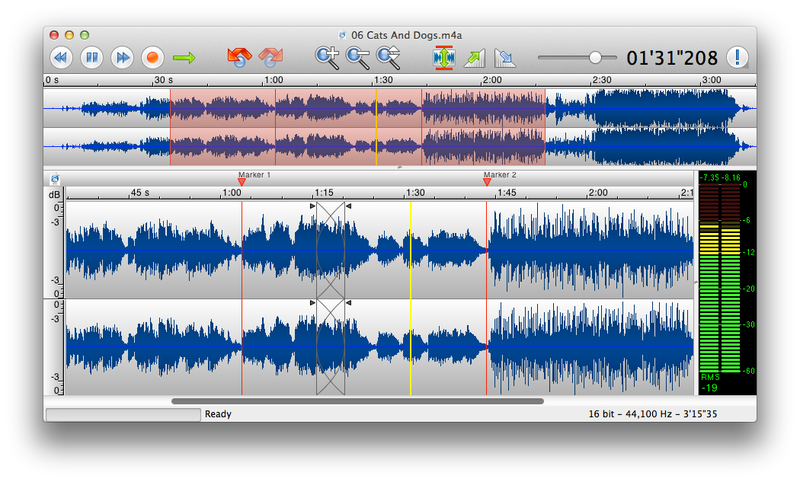 Converting a single file, or a whole folder of audio files from one format to another is straightforward. Batch processing many files. You load a list of sound files in TwistedWave, and it will automatically cut them, apply fades in/out, equalize, convert to mp3, or anything else. TwistedWave is available as a fully functional 30 day demo. You can purchase a serial number to unlock TwistedWave for $79.90. Requires macOS 10.9 or later. Still on macOS 10.7 or 10.8? You can use TwistedWave 1.20.2. Still on macOS 10.6.8? You can use TwistedWave 1.19.1. No Risk! We offer a 90 day money back guarantee. 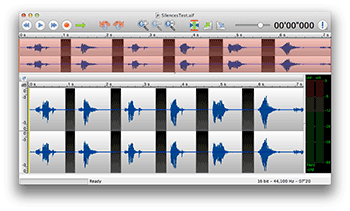 With a powerful built-in silence detector, TwistedWave makes it very easy to automatically split an audio file into several parts separated by silences, and save them in distinct files. 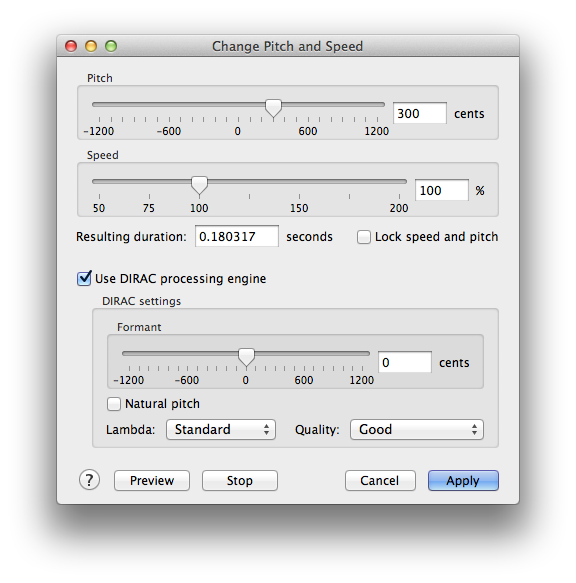 TwistedWave now has a very powerful batch processing engine. 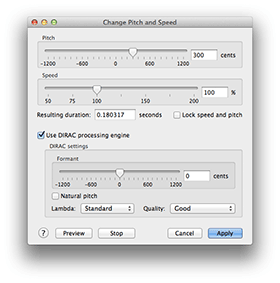 It can work on any number of files, or entire file hierarchies, and apply any number of effects on them, such as amplifying, applying an Audio Unit or VST plugin or changing the frame rate, for instance. A processed file can be saved in a different file format. Because TwistedWave can read and write in many different file formats, this makes a very powerful batch converter. 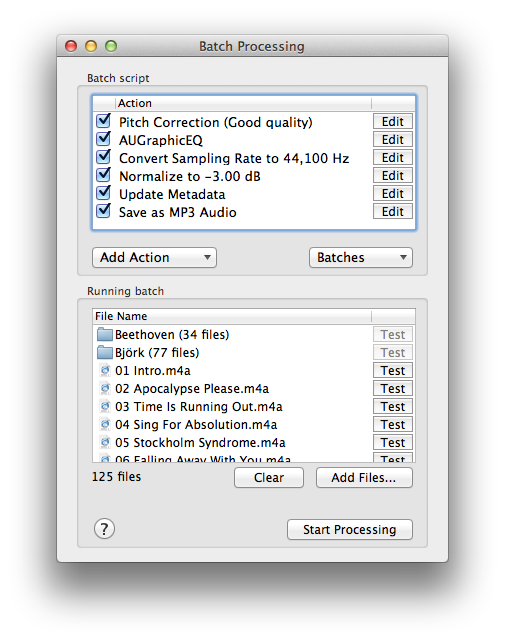 The batch processing can also be used to generate the waveform image from a list of files. This can be used to generate small images representing sound files to build a web site, for instance. TwistedWave allows you to change the pitch or the speed of a piece of audio independently of each other. This capability is provided with the ZTX Time Stretch/Pitch Shift technology, licensed from Zynaptiq GmbH, one of the most advanced algorithms for time-based manipulation of audio material available today. With an excellent audio quality, it is really usable for pro audio work. The ZTX technology also enables TwistedWave to perform pitch correction. Given a piece of audio, ZTX will automatically pitch shift it to the closest note. Make your own iPhone ringtones! Load your own music, cut your favourite part, fade in and out, export to the iPhone ringtone format, and you're done! When TwistedWave is busy loading a large file, or applying a complex effect, all the work happens in the background, and you can continue working with your document, applying new effects to the wave. With TwistedWave, the time where you had to wait for your audio editor to perform a long computation is over. Read more. 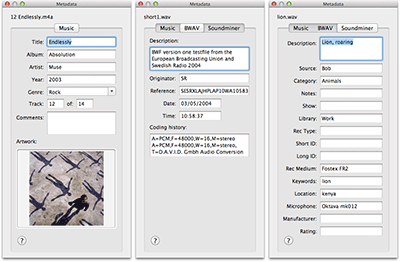 TwistedWave can read and save music metadata, such as the artist name, song title or album art from files in the aiff, wav, mp3, mp4, flac and ogg/vobis format. 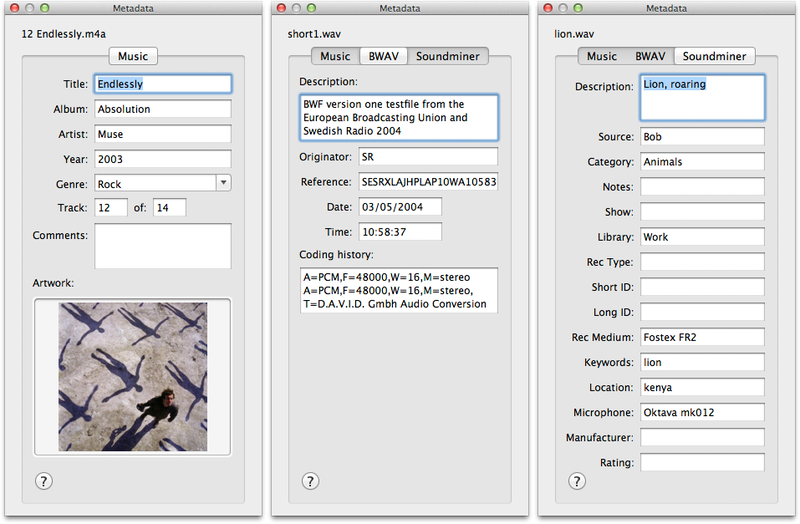 Additionally, TwistedWave supports BWAV metadata, as well as Soundminer metadata for wav and aiff files. Furthermore, these metadata can be saved as foreign metadata in flac files. 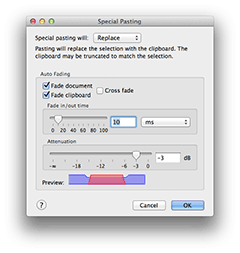 A special pasting mode will automatically fade in and out the clipboard and the existing contents of the file when pasting to make the transitions smoother. 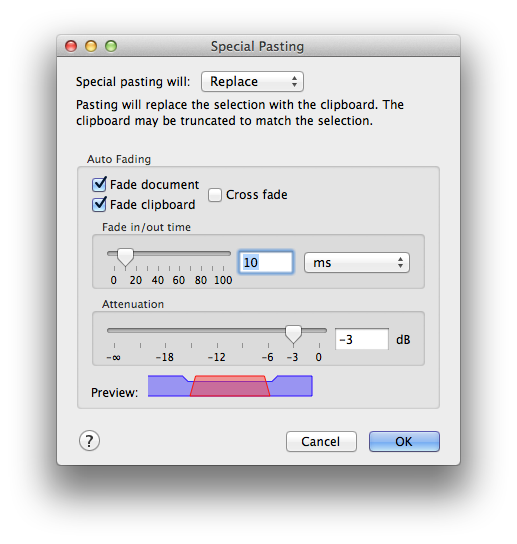 A number of options enables you to select whether or not to apply fades in and out, the fades duration, and more. In order to immediately see how the fades are applied, a sketch shows a preview of the file, represented in blue, and the clipboard in red. The slopes show where the fades take place. Radio package editing becomes very easy with the clip list. In just a few steps, you can quickly zip through a long recording, select parts of the wave you are interested in and copy them to the clip list. 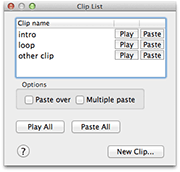 You can then create a new document by pasting your clips from the list. For a successful mastering, it is often necessary to apply more than one effect to a song. With a regular audio editor, you have to apply the effects one by one, and you can't use different presets for an effect without undoing it, and all the effects you applied after it. Zooming in and out of the waveform is very fast. Command-click and drag the mouse to zoom very accurately, while the wave is being refreshed more than 100 times per second. Even when the files are several hours long, when the file has not finished loading, or when an effect is being applied, TwistedWave remains very responsive. At any time, you can undo all the modifications you have made to your file. You can freely experiment with new effects without fear of making mistakes! TwistedWave can handle your audio at a resolution up to 32-bit and 192 kHz sampling rate, which makes it truly a professional quality audio editor. With the ZTX Time Stretch/Pitch Shift technology, you can achieve the best sounding time/pitch manipulation available in the industry. TwistedWave works great as an audio converter. It is able to read and export sound files in many formats, including: wav, aiff, au, snd, sd2, mpg, mp2, mp3, mp4, m4r (iPhone ringtones), m4a (iTunes), m4b (audiobooks), aac, caf, flac, ogg/vorbis, wma, WavPack, Wave64. It is also possible to import the sound track from a movie in mov, avi, flv (Flash Video), wmv or mpeg format. When you are working on an audiobook or a podcast, TwistedWave automatically converts the markers as chapters in the file, and back. The chapters are perfectly recognized by iTunes and the iPod. They make it very convenient to jump from one part of the file to the next, or seeing what chapter is currently being played. TwistedWave can also read and save Ambisonic B-Format (amb or ambi) sound files, produced by many popular multichannel audio recorders. 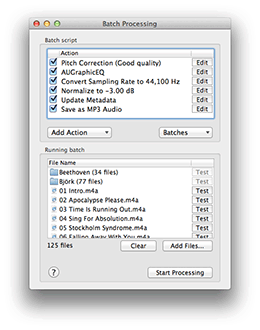 TwistedWave handles multichannel files as easily as mono or stereo files. Multichannel Audio Unit or VST plugins can be applied to files with an arbitrary number of channels.